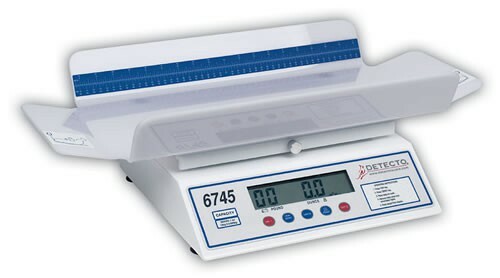 Digital Baby Scale with Tray, manufactured by Detecto, is a top-of-the-line digital pediatric scale with multiple functions. Featuring a spacious weighing tray, babies have plenty of room to lie comfortably. In addition, there is a lock-weight feature that allows a medical professional to accurately capture even the most active baby's weight. Including an easy-to-read liquid-crystal display, you are certain to always read accurate data. Also including an integral tape measure, a medical professional can quickly determine an infant's length, too. With the simple press of a button, you can easily switch between English and Metric units. Truly, the Digital Baby Scale with Tray will meet all of your expectations and needs. Once a baby's weight and length have been recorded, you can easily remove the tray with its lock-pin. Having a removable tray allows it to be cleaned quickly and thoroughly, especially with Sani-Cloth Germicidal Disposable Wipes. 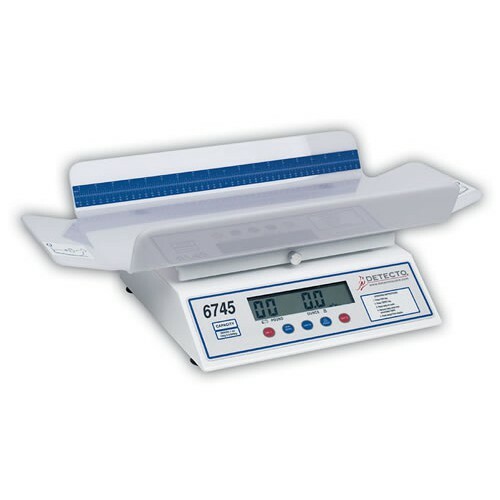 Allowing the flexibility you need, the Digital Baby Scale with Tray can attain power through three different methods. It works through rechargeable NiCad batteries, six C batteries, or by an AC adapter. This scale also features an automatic shutoff mode to guarantee the longest battery life. This scale also has an RS232 serial port which allows connectivity to printers and computers. Switch between English and Metric units. Weight Units: Pounds and ounces/kilograms. Tray Dimensions: 26"L x 12.2"W.
Integrated Ruler: 22 in/56 cm. Application: To measure weight and length.